We left our beach life for city life this past month, exploring Tequila, Guadalajara, Patzcuaro, and Mexico City. It's so easy to get caught up in the mellow beach culture, but we were ready for a change of scenery and weather. We swapped constant heat and humidity of the coast for the dry air and cool nights and mornings of the mountains. Several travellers warned us to be careful as we traveled inland. We're always very aware, but honestly, we didn't experience any situations that made us feel uncomfortable. In Tequila we camped on on a mountain road on the way up to a volcano and did a tour of a tequila distillery. We loved camping in the wild again. We decided to make all our stops to museums (including the tequila distillery) part of our road school regimen! We had heard horror stories about driving in big Mexican cities in RVs, and so we were a bit apprehensive about driving in Guadalajara. But we stayed on the main roads, and found great parking at a Bikram Yoga studio on the south end of town with a huge lot. We took an Uber for the first time to visit Guadalajara's historic centre and enjoyed checking out museums, cathedrals and art galleries for a day. 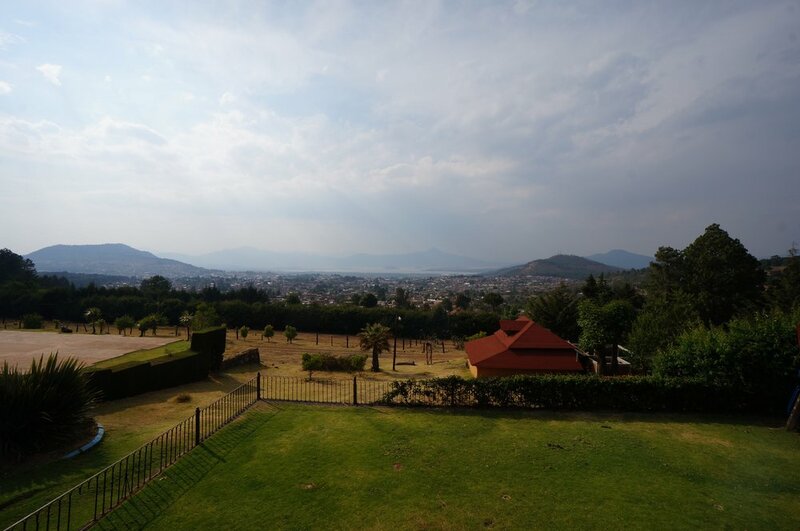 Next we went to Patzcuaro to enrol in Spanish lessons for 2 weeks. We got set up at a campground and each morning we would take a collectivo downtown, grab a snack (our favs were the empanadas, corundas, and fresh juices), and head to Spanish school for the day. Arjuna’s lessons were 2 hours each morning and Josh and I went for 4 hours each day, each doing 1 week. Our Spanish definitely improved! We really enjoyed having a set routine each day and spending so much time hanging out in the plazas. It was especially interesting during Semana Santa with all the religious displays and the artisan fair. Patzcuaro was also a great base for a couple of day trips. We hiked to the ruins of the San Juan church -- the only building partially remaining when a volcano erupted in 1943 and buried 2 villages under its ashes. After our hike, we also got to enjoy the BEST corn quesadillas that we've had in Mexico so far. We also drove to Paracho, which is famous for its artisan guitar shops. Since Josh couldn't figure out how to fit a second full size guitar in the Earthroamer, we decided that we could probably find space for a smaller guitar for Arjuna. We do want our kids to learn an instrument on the road, and I figured even though the guitar takes up a lot of space, it's definitely less irritating than a recorder! We decided to avoid driving the Earthroamer in Mexico City (there really isn't anywhere to camp anyways) and stored the Earthroamer at a campground an hour North of the city. We took a bus into CDMX and stayed in a hostel to explore the most populated city on the planet for a few days. We loved the Anthropology Museum, but Arjuna did not. Luckily, there are amazing playgrounds and green areas to keep the kids happy. Our trick was trying to find ruins and museum displays that reference war or human sacrifice to keep him interested, and when that failed, we'd alternate museums and playgrounds! We really loved Mexico City and got around by walking or taking the subway and felt completely safe there the entire time. After Mexico City, we returned to our campground in Teotihuacan and hiked the Pyramids of the Sun and the Moon. These are some of the largest pyramids in the world and have been preserved incredibly well. It was a lot of walking and climbing, but luckily we found information on the human sacrifices that were made during the construction of the pyramids, so Arjuna was totally on board! After a month exploring cities, museums, and ruins, we're ready to go back to the beach! That's the beauty of the nomadic life!